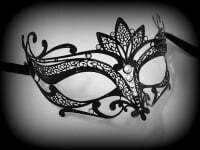 Give your party look a daring twist with this gorgeous accessory that's perfect for any event from a prom to a lavish masked ball. Give the classic Venetian style a modern makeover with this distinctive Flora Filigree Metal Mask by Simply Masquerade which will show off your luxurious and sophisticated sense of style. 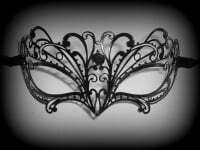 Featuring an eye-catching scroll and lace design this elegant mask is finished in black gloss to create an impeccable sense of understated elegance. 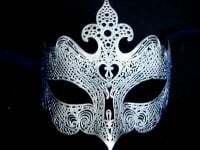 An extravagantly designed and handcrafted filigree mask is for women to wear. With traditional soft satin ties for both comfort and a secure fitting.